Here at the Views of the Solar System Cassini at Saturn web page you will find the latest images and information returned by the Cassini spacecraft. The ring system begins from the inside out with the D, C, B and A rings followed by the F, G and E rings. The red in the image indicates sparser ringlets likely made of "dirty," and possibly smaller, particles than in the icier turquoise ringlets. Images taken during the Cassini spacecraft's orbital insertion on June 30 show definite compositional variation within the rings. 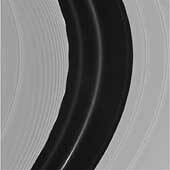 This image shows, from left to right, the outer portion of the C ring and inner portion of the B ring. The B ring begins a little more than halfway across the image. The general pattern is from "dirty" particles indicated by red to cleaner ice particles shown in turquoise in the outer parts of the rings. The ring system begins from the inside out with the D, C, B and A rings followed by the F, G and E rings. These graphs illustrate wind strength (bottom) and temperature above Saturn. The data were acquired by the Cassini spacecraft's composite infrared spectrometer when Saturn had just begun summer in its southern hemisphere. Altitude increases in the upward direction, and Saturn's south pole is to the right. The color red indicates higher temperatures, and stronger winds. As the top graph show, temperatures are cooler in the troposphere (the layer just above the cloud deck). In the upper stratosphere (the layer above the troposphere), temperatures increase toward the south pole. Temperature variation is muted in the upper troposphere. These observed temperature changes allow the east-west winds to be determined. The measured cloud-top winds from NASA's Voyager mission have also been used to create this wind plot. This is the first time that the stratospheric winds have been determined. They show a marked decline of about 140 meters per second (approximately 300 miles per hour) at low latitudes, moving from the cloud tops to higher levels. The origin of this decay, or wind speed reduction, is not known. Evidence from the visual and infrared mapping spectrometer on the Cassini spacecraft indicates that the grain sizes in Saturn's rings grade from smaller to larger, related to distance from Saturn. Those data (right) are shown next to a corresponding picture of the rings taken by Cassini's narrow angle camera. Saturn's rings are thought to be made up of boulder-size snowballs. By looking at the rings with the visual and infrared mapping spectrometer, the size of the ice crystals, or grains, on the surfaces of those boulders can be determined. This visual and infrared mapping spectrometer has a spatial resolution similar to that of the human eye, so it provides a view analogous to standing on the spacecraft. Only instead of looking at the rings in visible wavelengths, the instrument sees wavelengths beyond what human eyes can see, ranging from the ultraviolet to the infrared. The latest observations show that grain sizes range from very small, like powdery snow on Earth, to larger grains, like more granular snow. The visual and infrared mapping spectrometer on the Cassini spacecraft has found evidence for a material dubbed "dirt" in Saturn's rings. 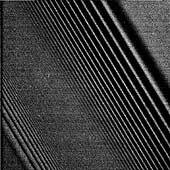 The observations indicate that some type of sorting mechanism is concentrating this unidentified material in the gaps between the rings. 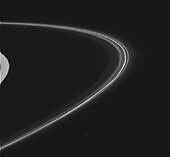 The images here show the rings just after Cassini successfully entered Saturn's orbit. 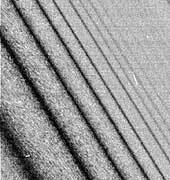 The infrared reflectance image shows the brightness of scattered light transmitted through the rings. 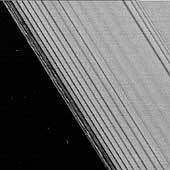 The thicker parts of the rings block more light, while the thinner parts, like the Cassini Division, let more light through. Assuming the rings are made of boulders, they might appear as a multitude of tiny moons. 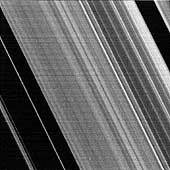 The water ice strength image shows the amount of water in the rings, which appears to peak in the region of the A ring. 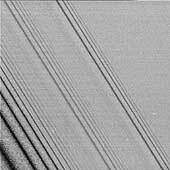 The "dirt" image shows that the so-called dirty material is most abundant in the thinnest parts of the rings: the Cassini Division, in the Encke and in other small gaps. This material appears remarkably similar to what Cassini measured on Saturn's moon, Phoebe. This graph illustrates the Cassini spacecraft's transition into Saturn's magnetosphere from an outer region called the magnetosheath. A magnetosphere is a magnetic envelope of charged particles that surrounds some planets, including Earth. In between it and a boundary called the bow shock -- where solar winds bend to avoid the magnetosphere -- is an area called the magnetosheath. Saturn's magnetosphere is seen for the first time in this image taken by the Cassini spacecraft on June 21, 2004. A magnetosphere is a magnetic envelope of charged particles that surrounds some planets, including Earth. It is invisible to the human eye, but Cassini's Magnetospheric Imaging Instrument was able to detect the hydrogen atoms (represented in red) that escape it. The emission from these hydrogen atoms comes primarily from regions far from Saturn, well outside the planet's rings, and perhaps beyond the orbit of the largest moon Titan. 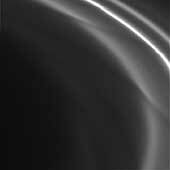 The image represents the first direct look at the shape of Saturn's magnetosphere. Previously, NASA's Voyager mission had inferred what Saturn's magnetosphere would look like in the same way that a blind person might feel the shape of an elephant. With Cassini, the "elephant" has been revealed in a picture. This picture was taken by the ion and neutral camera, one of three sensors that comprise the magnetosphereic imaging instrument, from a distance of about 3.7 million miles (about 6 million kilometers) from Saturn. This graph illustrates the series of sonic booms that took place when the Cassini spacecraft crossed Saturn's bow shock. A bow shock is a shock wave located where incoming solar wind meets a planet's magnetosphere, or magnetic bubble. Differences in electrical charges cause the solar wind to curve around the magnetosphere in the same way that air flows around a supersonic airplane. The resulting turbulence is heard as a sonic boom and is represented here as an increase in wave frequency. Scientists were surprised to discover that Saturn's bow shock was located at a distance of 3 million kilometers (1.9 million miles) from Saturn, much farther out than they had predicted.